That escalated quickly. One minute there's a tight soap-opera, with space weary astronauts and scientists, anxiously and frustratingly riling each other as they prepare for their long haul back to Earth, knowing they've been unsuccessful in their mission to find life on the red planet. The next, there's a crazed homicidal zombie battering the airlock with his gaunt black skinned face hell bent on death, carnage and really spoiling the going away party. And that's the thing. 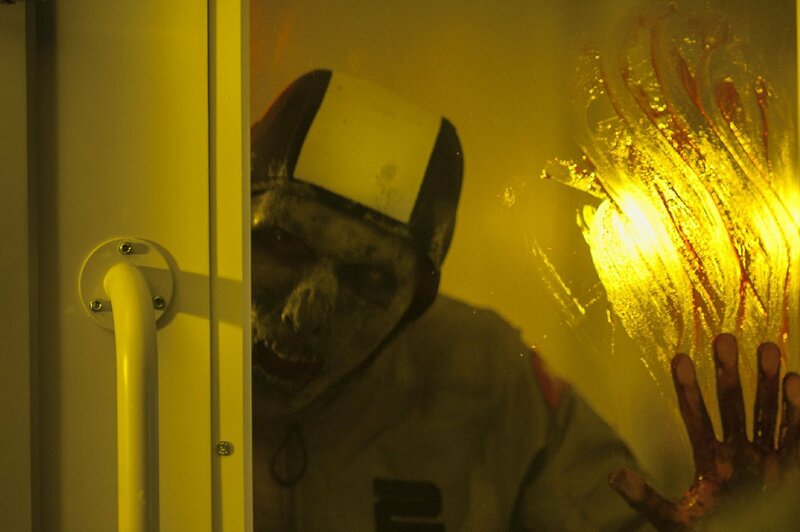 As much as I enjoyed début director Ruairi Robinson's claustrophobic little zombie survival story there's just not enough subtlety and nuance to proceedings. The result, while competently put together with a strong narrative and its solid cast, is never more than its constituent parts; it's all rather bland and safe, and it's a bit of a pity. Their timing is atrocious. Okay they would be arriving back at Earth without plaudits, their mission deemed a failure, with a new crew already well on the way to scientific immortality, but one more day, nineteen hours to be precise, to stay out of trouble and they'd still be alive. We've watched enough horrors by now though to know it only takes a little over-extending, a small bending of the rules and a tiny bit of deceit by one self-centred idiot to put in motion a series of events that leaves most, if not all, others in a world of pain. And in The Last Days on Mars it's Marko Petrovic (Goran Kostic) the eight person crew has to thank, who on the eve of evacuation decides he'll break protocol and lie to take one final trip out to a site he believes may contain fossilized evidence of bacterial life; though instead of bringing him fame and fortune, it brings him a bad fall and a nasty case of dead and zombie. The action is gripping, the effects lavish and production polished it's just the ensuing hour of good quality zombie shenanigans is rather formulaic and by the number. A fight here, a siege there, another fight here, a bit of betrayal and a last ditch plan to survive it's good manic fun but just all a bit derivative and predictable. It's also all rather in your face with little play with suspense or ambiguity. 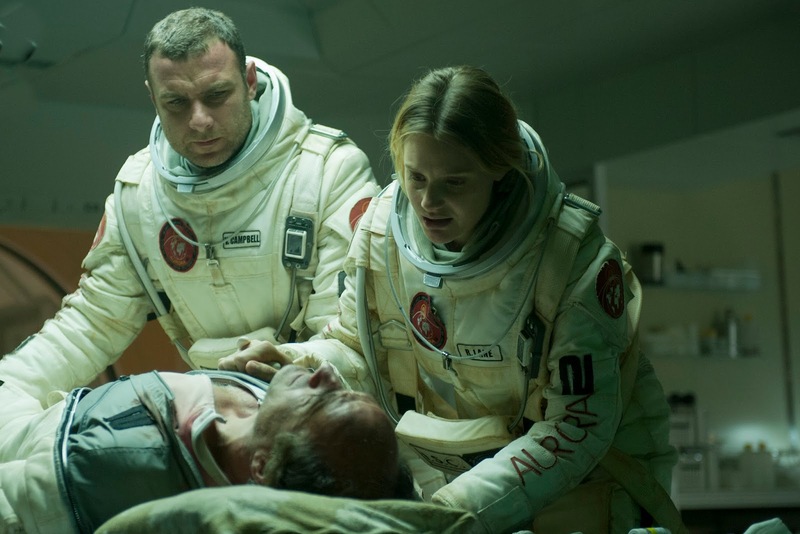 Marko lies dead in an alien pit, Lauren Dalby (Yusra Warsama) is left alone to stand guard while the rest of the crew lead by Charles Brunel (Elias Koteas) go get the body-in-alien-fungus-hole-retrieval-kit. On returning they're gone but there's some obvious tracks leading back to the base, which the film cuts to just in time to see them arrive, in full-on no-nonsense zombie siege mode. There's really no pause for breath, no time to gather thoughts, establish motivations, build tension. They arrive, they get in, they start bashing heads and drilling stomachs and we're expected to go along with it all. There's no mention of zombies on the box and it could easily have been a film I overlooked, but it's as zombie as you can get. The black veined oxygen deprived gut munchers are very much dead in the human sense with total loss of self and identity. They're highly infectious, they're driven with an insatiable hunger to kill, and possibly eat their victims and they really look the part, though with a c. $7m budget I'd expect them too. It's the alien bacteria that's responsible for all the trouble and the film adheres to the tried and tested trope that dictates blood exposure to lead to slow painful death then death to zombie, and there's not much in the way of dubiousness. Though for mindless homicidal brutes they're pretty nifty with all the tools, machinery and explosives they use to use, which maybe opens some coherency issues, but really it just cements their credentials as 'A' tier zombie bad assess one should not want to trifle with. 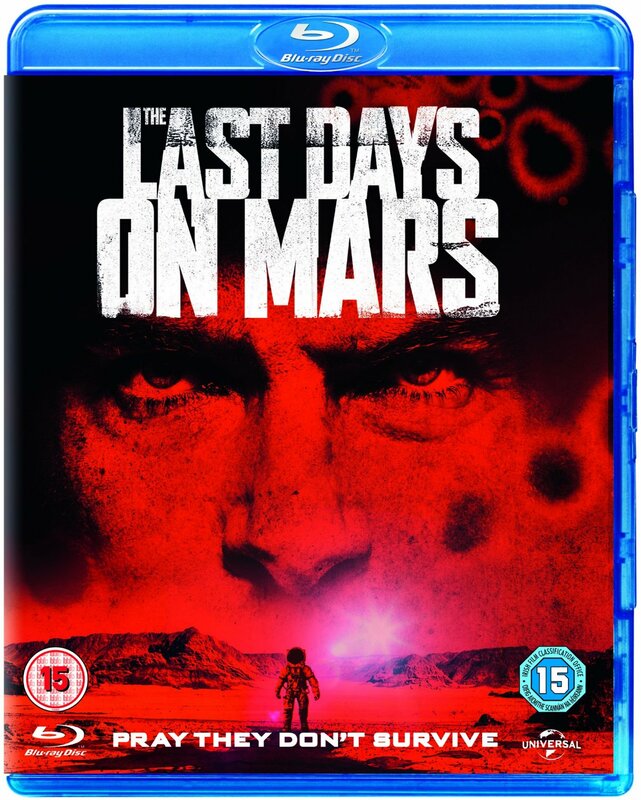 The Last Days on Mars is a solid action oriented space horror that doesn't really do much wrong other than not dare to be a more intelligent and passionate. With little emotional depth to the characters and some rather sombre performances the atmosphere of peril and dread you feel should be pervasive and consuming fails to appear, and the pain, anguish and ultimate deaths of the crew fail to carry much weight. This is no more exemplified than with star of the show Liev Schreiber as Vincent Campbell, hero and lone survivor, and the deliberately left-open final life and death scene, and my genuine lack of concern and enthusiasm towards its outcome. 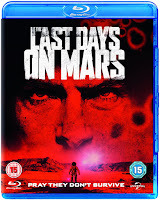 With fighting scenes that are nicely choreographed and look great there's a simple uncompromising action horror here that will entertain, and Mars does make a beautiful back drop for full on zombie fun; it's just, like the red planet itself, lacking in atmosphere, and all rather flat and lifeless - 6/10.